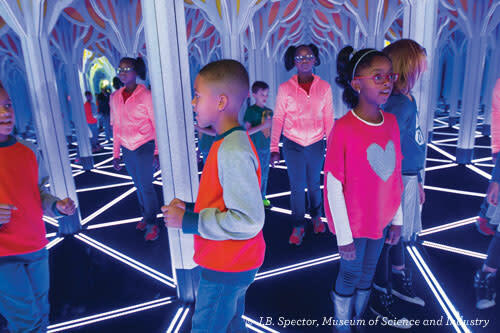 Discover fun things to do in Chicago with kids & teens in this travel itinerary. With so many fun things for kids to do in Chicago, there are about a zillion combinations for the ultimate Chicago weekend. From museums and zoos to kid-friendly restaurants, this two-day lineup should cover it. Insider tip: these are all indoor activities so have this itinerary ready to go in the winter, or to escape any rainy days. ❏ Get going with gourmet doughnuts and beverages at Doughnut Vault. ❏ Head off to Navy Pier, the number one fun thing to do in Chicago with kids. Once inside, browse the shopping stalls, see a movie at the Navy Pier IMAX Theatre or visit the Chicago Children&apos;s Museum where kids can climb three stories of rigging to a crow&apos;s nest. The year-round gondolas on the Ferris Wheel are climate controlled so don&apos;t miss out on the views. ❏ For lunch, fill up on deep-dish pizza at the new Giordano&apos;s at Navy Pier. ❏ Head down to the Museum of Science and Industry, where you can spend the rest of the day in the U-505 submarine, the coal mine or the mirror maze. ❏ Eat at Medici on 57th, where pizza, burgers and families are king. The Hyde Park institution with a hippie vibe is a neighborhood favorite with other dinner staples like chicken fingers and fettuccine alfredo filling out the menu. ❏ Order seasonally-inspired breakfast fare at the airy Summer House Santa Monica. ❏ Spend the rest of the morning surrounded by butterflies at the Peggy Notebaert Nature Museum. As you stroll the open-air habitat, they flutter all around you and might even make a special landing on your little one. ❏ For lunch, order a specialty burger and a scrumptious milk shake at R.J. Grunts. Located right across from the Nature Museum, they will quickly calm any hungry children in your party. 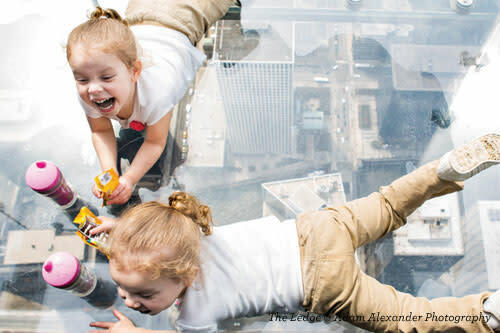 ❏ Join in a treasure hunt at Skydeck Chicago at Willis Tower. 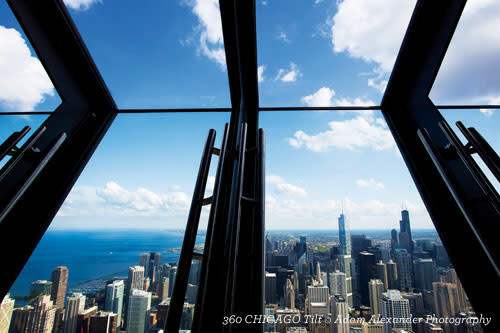 Known as Sears Tower to some, this observatory deck soars 1,353 feet high above the skyline so you can spend the day pointing out all your finds below in a game of I SPY: from freight trains to the Navy Pier Ferris wheel. Or dare to step on the Instagram-famous Ledge. ❏ Munch on a bag of Garrett&apos;s Popcorn. Eating popcorn is not just for the movies! This local-Chicago treat is known the world over, and the lines out the door are a sure sign of its many fans. ❏ Later, attend a play at the Chicago Children&apos;s Theatre or Emerald City Theatre. Both companies take their audience to heart and create award-winning productions specifically for pint-size theater attendees. Looking for some family-friendly hotel options? Here&apos;s two: Nap the night away at Hotel Palomar Chicago, a Kimpton Hotel. Kids get a welcome gift, can enjoy a "mocktail" and even have a live pet goldfish in the room. Or kick back with a night at the Four Seasons Hotel Chicago. Kids can swim in the indoor pool and have the Ice Cream Man bring his cart right to the room. ❏ The non-verbal antics of the blue-faced creatures at Blue Man Group are teen-approved. ❏ Get a thrill and angle forward from 1,000 feet above ground on Tilt at 360° CHICAGO (formerly the John Hancock Observatory). ❏ Watch hilarious improv suitable for all ages at ComedySportz. ❏ Get a custom-made shirt at The T-Shirt Deli. They&apos;ll put it in a bag with potato chips. ❏ Have a Beluga Encounter at the Shedd Aquarium. ❏ Play bocce or bowl at Pinstripes. ❏ Get active with a whole new competitive game at WhirlyBall. ❏ Try the interactive skill challenges, see sports memorabilia, play games and eat dinner at the Chicago Sports Museum. Spotlight on... Fabulous Toy Shops! Get matching outfits for you and your doll at the original American Girl Place. Find more than 200 brain games at Marbles: The Brain Store. Let kids loose in the LEGO Store inside Water Tower Place. Find the latest Disney toys at the Disney Store on The Magnificent Mile and State Street. Take your child to story time at Play in Logan Square. Encourage your young budding architect at Building Blocks Toy Store. 57th Street and Lake Shore Dr.
2056 N. Lincoln Park W.